Professor Worsak’s research in the early days forcused on developing new finite element methodologies and numerical methods. In 1970s, his interests turned to finite element modeling of large deformation plates and shells, time integration methods, contact and impact problems, nonlinear solution techniques as well as the numerical aspects of dynamic problems. He was also interested in finite element software development especially under personal computer environment. His software package, Microfeap, earned wide-spread users in the region and earned him award from National Research Council of Thailand.His current interest is given to meshfree methods based on Kriging Interpolation. The use of Kriging Interpolation in conjunction with layered domains of influence helps extend the power of finite element beyond its limits. This results in smooth and very accurate solution for both displacement and stress fields. His other current interest is also structural health monitoring. Based on this research, he has introduced a so-called Global Flexibility Index (GFI) that can be used to monitor the global weakening of highway bridges. T.J.R. HUGHES, R.L. TAYLOR, J.L. SACKMAN, A. CURNIER, and W. KANOKNUKULCHAI, “A finite element method for a class of contact impact problems”, Computer Methods in Applied Mechanics and Engineering, 8, 249 276 (1976). T.J.R. HUGHES, R.L. TAYLOR, and W. KANOKNUKULCHAI, “Numerical prediction of head/helmet system response,” in Measurement and Prediction of Structural and Biodynamic Crash Impact Response, ASME, New York, 1976, pp. 151 165. T.J.R. HUGHES, R.L. TAYLOR, and W. KANOKNUKULCHAI, “A simple and efficient finite element for plate bending”, Int. J. for Num Methods in Engng, 11, 1529 1542 (1977). W. KANOK NUKULCHAI, “A simple and efficient finite element for general shell analysis”, Int. J. for Num Methods in Engng, 14, 179 200 (1979). W. KANOK NUKULCHAI, R.L. TAYLOR, and T.J.R. HUGHES, “A large deformation for shell analysis by the finite element method”, Computers and Structures, 13, 1/2, 19 27 (1981). 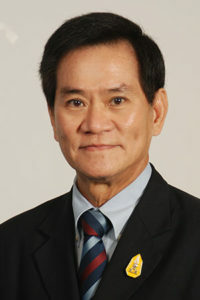 W. KANOK NUKULCHAI, P.H. DAYAWANSA, and P. KARASUDHI, “An exact finite element model for deep beams”, International Journal of Structures, 1, 1, 1 7 (1981). W. KANOK NUKULCHAI and V.W. SUARIS, “An efficient finite element scheme for elastic porous media”, Int. J. of Solids and Structures, 18, 1, pp. 37 49 (1982). W. KANOK NUKULCHAI and A.K. GILANI, “A macroelement for waffle slab analysis”, Computers and Structures, 15, 2, pp. 117 122 (1982). C. POLPRASERT, W. KANOK NUKULCHAI, and V.S. RAJPUT, “A ferro cement digester: biogas and biomass production”, Journal of Ferrocement, 12, 1, pp. 25 34 (1982). W. KANOK NUKULCHAI, S.Y. LEE, and P. KARASUDHI, “A versatile finite strip model for three dimensional tall building analysis”, International Journal of Earthquake Engineering & Structural Dynamics, Vol. 11, pp. 149 166 (1982). W. KANOK NUKULCHAI and Y.S. SHIN, “Versatile and improved higher order beam element”, J. of Structural Engineering, ASCE, 110, 9, 2234 49 (1984). KANOK NUKULCHAI, “On a Microcomputer Integrated System for Structural Engineering Practice”, Computers and Structures, Vol. 13, No. 1, 33 37 (1986). Large Deformation Analysis of Structural Elements”, Proc. of JSCE, Structural Engineering /Earthquake Engineering, Vol 3, No. 1, April 1986. W. KANOK NUKULCHAI and M. SIVAKUMAR, “Degenerate Elements for Combined Flexural and Torsional Analysis of Thin Walled Structures”, J. of Structural Engineering, ASCE, 114, 3, 657-674 (1988). W. KANOK NUKULCHAI and W.K. WONG, “Element-Based Lagrangian Formulation for Large Deformation Analysis”, Computers and Structures, Vol. 30, No. 4, pp. 967-974, 1988. T. CHAISOMPHOB, W. KANOK-NUKULCHAI, and F. NISHINO, “An Automatic Arc Length Control Algorithm for Tracing Equilibrium Paths of Nonlinear Structures”, Structural Engineering/Earthquake Engineering, JSCE, Vol. 5, No. 1, April 1988, pp. 205-208. W KANOK NUKULCHAI, “Closure to Degenerate Elements for Combined Flexural and Torsional Analysis of Thin Walled Structures”, J. of Structural Engineering, ASCE, Vol. 115, No. 9, pp. 2412-2413, 1989. YAMAGUCHI, W. KANOK-NUKULCHAI, T. OHTA, “A Study of Finite Displacement Analyses of Beam Structures by the Finite Element Method”, J. of Structural Engineering, JSCE, Vol. 35A, pp. 175-183, 1989 (in Japanese). W. KANOK-NUKULCHAI and K.T. Chau, “Point sink fundamental solutions for subsidence prediction”, J. of Engineering Mechanics, ASCE, 116, 5,1176-1182 (1990). W. KANOK-NUKULCHAI, P.K. Yiu, and D.M. Brotton, “Mathematical Modelling of Cable-Stayed Bridges”, Structural Engineering International, J of the Int. Asso. for Bridge and Structural Engineering (IABSE), SEI 2, 108-113 (1992). W. KANOK-NUKULCHAI and S.F. LIN, “Nonlinear Analysis Using Ritz Vectors Reduced Basis”, Computers & Structures, Vol.44, No.1/2, 1992, pp. 117-124. G.M. Hong, C.M. Wang, and W. KANOK-NUKULCHAI, “Elastic Buckling of Circular Plates with Allowance for Pre-Buckling Deformation” in Journal of Engineering Mechanics, ASCE, 119, 5,.905-916 (1993). W. KANOK-NUKULCHAI, and G. Hong, “Nonlinear Modelling of Cable-Stayed Bridges”, Journal of Constructional Steel Research, Vol. 26, 1993, pp. 249-267. W. KANOK-NUKULCHAI and T. Susompow, “False Paradox of Torsional Buckling”, J. of Structural Engineering, ASCE, 119, 12 (1993). D. Gee-Clough, J. Wang and W. KANOK-NUKULCHAI, “Deformation and Failure in Wet Clay Soil: Part 3, Finite Element Analysis of Cutting of Wet Clay by Tines,” Journal of Agricultural Engineering Research, 58, 1994, pp. 121-131. W. KANOK-NUKULCHAI “Collapse of the Royal Plaza Hotel, Thailand,” in Structural Engineering International, Journal of the Internatioal Association for Bridge and Structural Engineering (IABSE), SEI Vol. 5 Number 1, February 1995, pp. 55-57. S.J. Lee, and W. KANOK-NUKULCHAI, “A Nine-node Assumed Strain Finite Element for Large-Deformation Analysis of Laminated Shells,” Int. J. for Numerical Methods in Engineering, Vol. 42, No. 5, 1998, pp. 777-798. E. Yamaguchi, W. KANOK-NUKULCHAI, Hammadeh, and Kubo, “Large displacement analysis of beams by degeneration approach,” Journal of Engineering Mechanics, ASCE, Vol. 125, No. 10, 1999, pp. 1140-46. W. KANOK-NUKULCHAI, and B.T. Tam, “Structure-fluid interaction model of tuned liquid dampers ,” Int. J. for Numerical Methods in Engineering, Vol. 46, No. 9, 1999, pp.. 1541-1558. W. KANOK-NUKULCHAI, W.J. Barry, and K. Saran-Yasoontorn, “Meshless formulation for shear-locking free bending elements”, Journal of Structural Engineering and Mechanics, 11, 2(2001), pp. 123-132. W. KANOK-NUKULCHAI, W.J. Barry, K. Saran-Yasoontorn, and P. H. Bouillard, “On elimination of shear locking in the element-free Galerkin method”, Int. J. for Numerical Methods in Engineering, Vol. 52, 2001, pp.705-725. R.F. Terregosa, and W. KANOK-NUKULCHAI, “Weight Optimization of Steel Frames Using Genetic Algorithm”, Advances in Structural Engineering, 5, 2 (2002), pp. 99-111. P. Tonsuk, and W. KANOK-NUKULCHAI, “Further investigation of element-free Galerkin method usign Kriging interpolation”, International Journal of Computational Methods, 1, 2(2004), pp.345-364. S.C. Han, K.D. Kim and W. KANOK-NUKULCHAI, An element-based 9-node resultant shell element for large deformation analysis of laminated composite plates and shells, Structural Engineering and Mechanics, 18, 6(2004), pp. 807-829. N. Anwar, W. KANOK-NUKULCHAI, D.N. Batanov, Component-based information oriented structural engineering applications, Journal of Computing in Civil Engineering, ASCE, 19, 1 (2005), pp.45-57. N. Anwar, and W. KANOK-NUKULCHAI, Framework for a general section designer software component, Computers and Concrete, 1, 3(2004), pp. 303-324. T. Vacharasintopchai, W. Barry, V. Wuwongse and W. KANOK-NUKULCHAI, A Semantic Web Services Framework for Computational Mechanics, Journal of Computing in Civil Engineering, ASCE, 21, 2  pp. 65-77. C. Pattamaprom, D. Dechojarassri, and W. Kanok-Nukulchai, Die Wirkung der Vulkarinsationsbedingungen auf das Netzwerk von Ebonit, Gummi Fasern Kunststoffe, Fachmagazin fur die Polymerindustrie, Jahrgang 59, GAK 7 (2006), pp. 428-433. S.C. Han, H.D. Ham, and W. KANOK-NUKULCHAI, Geometrically Non-linear Analysis of Arbitrary Elastic Supported Plates and Shells using an Element-Based Lagrangian Shell Element, International Journal of Non-linear Mechanics, 43 (2008), pp. 53-64. W. KANOK-NUKULCHAI and V. Vimuktayon, Suvarnabhumi Airport, J. Structural Engineering International, IABSE, SEI 1 (2009), pp. 1-6. F.T. Wong and W. KANOK-NUKULCHAI, On the Convergence of the Kriging-Based Finite Element Method, International Journal of Computational Mechanics, 6, 1 (2009), pp. 1–27. 1977 Earle C. Anthony Award, UC Berkeley. 2003 Bestowed the Royal Decoration of the Companion of the Most Admirable Order of Direkgunabhorn (4th class) by H.M. King Bhumibol Adulyadej. 2008 The First Nishino Medal, An award in memorial of the late Professor Fumio Nishino, in recognition for international contribution in the area of structural engineering.